Start by cutting the ends off of the baguettes. Then cut a diagonal slice about about 3" from the end, then a straight slice 3" from the first cut. Keep repeating the diagonal the straight cuts until the whole loaf has been sliced. You will end up with pieces that have one straight side and one diagonal side. 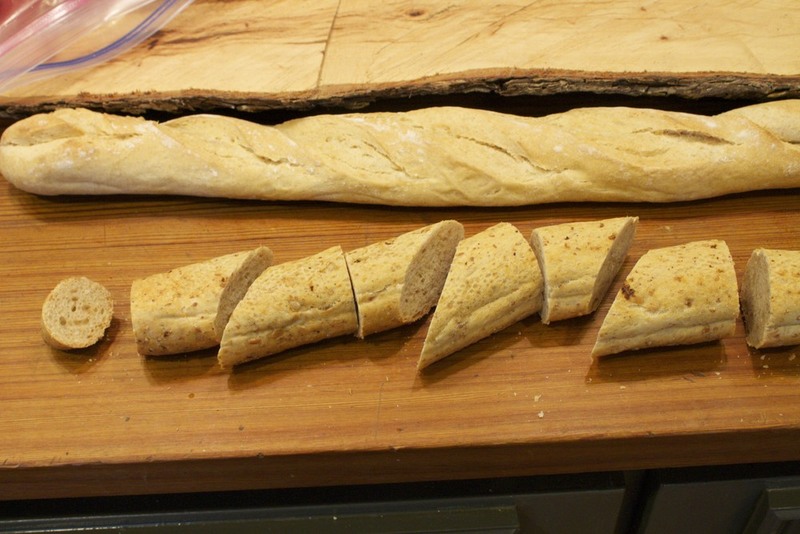 Take one piece and scoop out most of the bread from the diagonal end, being careful to leave some in the bottom. Spoon some dip into the cavity that is left, then stick in a few of the vegetables. Stand it up on the flat end. The baguettes I used were multigrain and seeded. I used a spinach and vegetable dip and a roasted red pepper hummus. The veggies I used were cucumber, carrot, red bell pepper, and yellow bell pepper. I stood them up and arranged them on a wooden tray. What a great way to serve a simple appetizer! Posted in In The Kitchen, Entertaining and tagged with appetizers, dips, veggies. July 4, 2013 by Lynn Adams.